Having arrived at her great aunt Charlotte’s house in the country ahead of her parents, Mary Smith finds herself bored, friendless and antagonised by a local boy named Peter. While Mary tries to adapt to her new environment, she comes across Peter’s cats Tib and Gib who lead her into the nearby woods where she finds a strange and powerful flower. Known as “fly-by-night,” the flower grants mysterious powers and when Mary accidentally gets goo from the destroyed bulb of the plant onto a broomstick, it comes to life and whisks her away to the magical Endor College. Exploring the College alongside its headmistress, Mary displays some magical prowess thanks to the flower’s power. But something isn’t right at Endor College, and Mary must utilise her new abilities to figure out just what is going on. 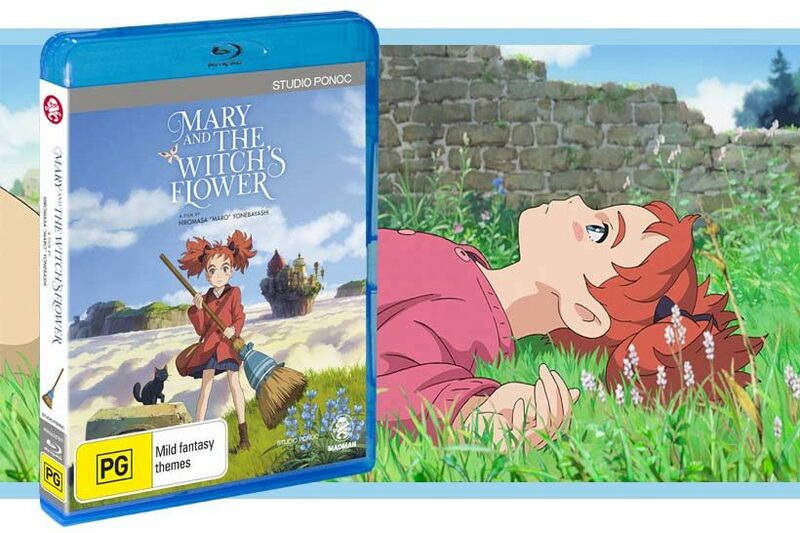 Mary and the Witch’s Flower is Studio Ponoc’s debut feature film and is based on Mary Stewart’s book The Little Broomstick. Given that the studio is helmed by ex-Studio Ghibli staff, the similarity in art styles is reassuringly familiar, but this acts as a double-edged sword as comparisons between the two studios and their visual and narrative styles are unavoidable. 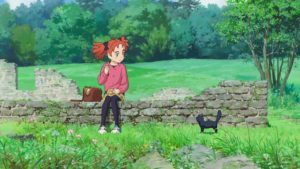 When it comes to visuals, Mary and the Witch’s Flower delivers like its Ghibli predecessors, with gorgeous renditions of the natural world and its elements, depicting fire, water and nature as mysterious and powerful. Character designs are also memorable, and the use of time and ‘mundane’ motion in the film is charming and effective. 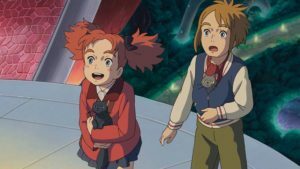 Unfortunately, while Mary and the Witch’s Flower captures an essence of wonder associated with the world it creates, it doesn’t really deliver on it. The beginning of the film is well-paced and charming, but the narrative starts to become less engaging once Mary visits Endor College and the major conflict of the film begins to take shape. Endor College itself feels like a set in a film rather than an actual realised location, with Mary breezing through areas of the school with Headmistress Mumblechoock with all the sense of a dull studio back-lot tour. 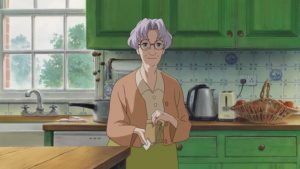 The students of Endor College are basically faceless window dressing that don’t affect the narrative of Mary and the Witch’s Flower in any way although their Headmistress directly contributes to its conflict. It made me wish for the variety of personalities that litter the worlds of Studio Ghibli films, such as the bathhouse workers in Spirited Away, the people of Irontown in Princess Mononoke, or even the students in the school club building in From Up On Poppy Hill. This lack of engaging worldbuilding or supporting characters leaves Mary and the Witch’s Flower in an odd position as the film looks like a Ghibli film but doesn’t feel like one, and there isn’t enough of a new direction from the film’s own power to resolve that dissonance. Also, I’m just going to say it, Peter is a less endearing version of Tombo from Kiki’s Delivery Service. 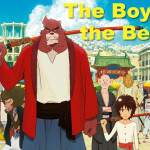 It’s comforting to see the Studio Ghibli style in a new film. Although computer-animated films produce some amazing visuals, whenever I watch an old Don Bluth, Disney or Ghibli hand-drawn animated film I experience this feeling that is two-parts joy and one-part loss. The styles of these films are gorgeous, and they breathe in ways not yet mastered by computer-animated films, and perhaps never will be. And they just aren’t made anymore, not by the same companies and not to the same scale. 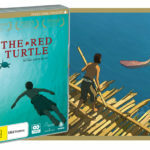 A new Studio Ghibli film used to come out every one or two years, but at the time I am writing this review there will be six years between Ghibli’s most recent release, When Marnie Was There which was released in 2014, and the release of Miyazaki’s new project How Do You Live which is currently predicted to be released in 2020. 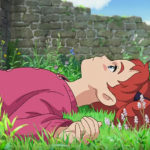 I’m grateful that Mary and the Witch’s Flower was released in a time when it seemed that no new projects would be produced in that gorgeous Ghibli style after Miyazaki (once again) announced his retirement and Studio Ghibli announced that it would stop producing feature-length films. 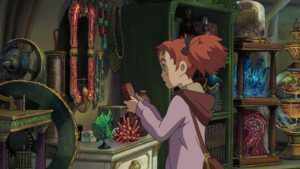 Even though the film doesn’t entirely maintain the narrative style and grace that is so viscerally associated with the aesthetic it’s using, there’s a part of me that unconditionally enjoys watching Mary and the Witch’s Flower because I love animation that conveys subtle mannerisms and how people engage with the world around them so masterfully. This release of Mary and the Witch’s Flower is packed with special features, including a featurette on the making of the film, interviews with the film’s director and producer, and creators of the film’s ending song Rain, and several trailers. 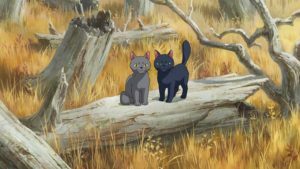 The featurette is the most interesting, and I would argue provides meaningful context to the creation of Mary and the Witch’s Flower and ties the themes of the film to the very real circumstances the film was made in, the idea being that what does one who is blessed with a mysterious and wonderful power do once that power is taken from them. 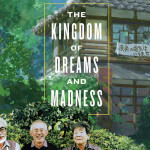 In particular it touches on some of ex-Ghibli staff director Hiromasa Yonebayashi and producer Yoshiaki Nishimura’s anxiety surrounding the creation of a film that, no matter how good, will only be judged as “not being Studio Ghibli”. It also discusses the history of Studio Ponoc and how Yonebayashi and Nishimura wanted to continue making films and needed to create their own studio after Miyazaki announced his retirement in 2014 and Studio Ghibli stopped making feature-length films. It’s a story that is easy to empathise with and I admire the two of them and their staff for creating an animation studio based on their desire to continue making films using the things they were taught by their predecessors and in order to improve their skills. Mary and the Witch’s Flower is a fine debut for Studio Ponoc, channelling gorgeous visuals inspired by beloved films that came before it and that manages to remain generally charming although aspects of the film drag or become less engaging as the film goes on. The themes of the film are mirrored in the struggles of its creators, and it’s hard not to appreciate that when viewing the film. I look forward to future films from Studio Ponoc, and hope they are able to establish a style of their own they can feel proud of as they move forward from Studio Ghibli.